The effect of experimental procedures designed to modify an intracellular phosphoinositide signaling pathway, which may be instrumental in the photophobic response of the protozoan ciliate Blepharisma japonicum, has been investigated. To assess this issue, the latency time of the photophobic response and the cell photoresponsiveness were assayed employing newly developed computerized videorecording and standard macro-photographic methods. Cell incubation with neomycin, heparin and Li+, drugs known to greatly impede phosphoinositide turnover, caused evident dose-dependent changes in cell photomotile behavior. The strongest effect on photoresponses was exerted by neomycin, a potent inhibitor of polyphosphoinositide hydrolysis. The presence of micromolar concentrations of neomycin in the cell medium caused both prolongation of response latency and decrease of cell photoresponsiveness. Neomycin at higher concentrations (>10 µM) abolished the reversibly of the cell response to light at the highest applied intensity. A slightly lower inhibition of cell responsiveness to light stimulation and prolongation of response latency was observed in cells incubated in the presence of heparin, an inositol trisphosphate receptor antagonist. Lithium ions, widely known to deplete the intracellular phosphoinositide pathway intermediate, inositol trisphosphate, added to the cell medium at millimolar level, also caused a slowly developing inhibitory effect on cell photoresponses. Mastoparan, a specific G-protein activator, efficiently mimicked the effect of light stimulation. It elicited, in dark-adapted ciliates, a ciliary reversal with the response latency, typical for photophobic response. Sustained treatment of Blepharisma cells with mastoparan also suppressed the photoresponsiveness, as in the case of cell adaptation to light during prolonged illumination. The mastoparan-induced responses can be eliminated by pretreatment of the cells with neomycin. Moreover, using antibodies raised against bovine transducin, a cross-reacting protein with an apparent molecular mass near 55 kDa within the Blepharisma cortex fraction was detected on immunoblots. The results obtained evidence that phospholipase C, a phosphoinositide cascade enzyme which is possibly activated by G-protein, and regulates the cytoplasmic inositol trisphosphate level, is indispensable for the photophobic response observed in Blepharisma. The pink protozoan ciliates, Blepharisma japonicum, are known to collect predominantly in shady areas, displaying a distinct negative photodispersal . This cell light-avoidance behavior arises primarily from a step-up photophobic response [2-5] but could also be a consequence of other light-dependent behavioral patterns observed in this ciliate, like a repression of ciliary reversal to a decrease in light intensity (step-down photoresponse) , an acceleration of swimming by prolonged illumination (positive photokinesis) [2-4] and negative phototaxis  as well. A photophobic response is observed in Blepharisma adapted to darkness or moderate illumination in response to a step-wise intensity increase of light stimuli . It consists of delayed cessation of forward movement (initial stop response) and a period of rapid backward swimming along a semicircular pathway. After the subsequent stop of backward swimming, the cell renews its' forward movement with accelerated speed (positive photokinesis), usually in a new direction. The strategy of cell light-induced behavior is an immediate and fast escape from harmful illumination. The photophobic behavior of Blepharisma is attributed to the cellular pigment, blepharismin, found in numerous membrane-vesicle granules [7-13]. These granules are located beneath the cell plasma membrane in the vicinity of the ciliary basal body and are distributed over the cell body [1, 14]. A rapid increase in illumination intensity elicits a gradual depolarizing receptor potential in Blepharisma which occurs with some latency time . The photoreceptor potential, at appropriate amplitude, can trigger in turn an action potential followed by the reversal of ciliary beating observed during the cell photomotile response, which is typical for ciliates. An overall latency of the peak of action potential generation was shown to closely correlate with the latency of ciliary reversal . These observations may suggest the existence of limiting biochemical steps, preceding the generation of bioelectrical and ciliary locomotor events [4, 15]. Such a possibility is quite likely, since in Blepharisma and the related Stentor, the motile photoresponses were greatly influenced by modulators of the cytoplasmic cGMP level [16-18]. In addition, it has been recently reported that light is capable of rapidly accumulating cytoplasmic inositol trisphosphate in Blepharisma . These accumulations were strongly suppressed by agents that are known to interfere with the phosphoinositide turnover [20-25]. Blepharisma is also equipped, as revealed by cytoimmunochemical examinations, with an inositol trisphosphate receptor-like protein located within the cell cortex . This line of findings indicates that the tested ciliates may indeed possess sensory transduction systems, with cGMP and/or inositol trisphosphate as possible transmitters. However, the complete picture of the system is still elusive and requires further investigation. To additionally verify the process of light signal transduction in Blepharisma we analyzed the influence of substances known to interfere with phosphoinositide turnover on the motile photobehavior of the cell using a newly developed computer assisted videorecording track system and standard macro-photography. In addition to behavioral experiments, an immunoblot analysis was employed to demonstrate the existence of a G-protein in the cortex fraction of Blepharisma cells. Some of these preliminary results have been already presented elsewhere [27, 28]. Stock cultures of the heterotrichous ciliate Blepharisma japonicum were grown as described elsewhere . Cells were collected by low-speed centrifugation from starved cultures and washed in an excess of fresh culture medium lacking nutritional components. The individual cells chosen for experiments were first adapted to darkness for at least 1 h and then transferred to the experimental chamber containing fresh culture medium (control) or test solutions. Before each recording, cells were maintained for 10 min in darkness at rest to avoid mechanical disturbances and to adapt to the control or modified solutions. A constant temperature of 22oC within the test chamber was automatically maintained throughout the experiments by an electronic controller, based on a semiconductor Peltier element (PKE 72, Peltron, Germany). The stock solutions were prepared using the control solution as a solvent. Neomycin sulfate, mastoparan (obtained from Vespula lewisii), LiCl and heparin, all of a reagent grade, were purchased from Sigma (U.S.A.). Cell movement was observed in infrared (IR) light using a low power microscope (Zeiss-Ergaval, Germany) equipped with an IR-sensitive CCD camera coupled to a video monitor. IR-light was delivered with microscope illumination equipment in combination with a far-red light filter (FRF-700, Westlake Plastics, U.S.A.). Motile responses induced in individual cells (spot method) or in cell samples (population method) were recorded on a tape recorder and subsequently transferred to a personal computer by replaying the videotape. The stored cell images were followed with appropriate software (PANt, Logitex, Poland), allowing the capture of the cell images in real time and an estimation, with good time resolution, of different locomotor parameters (distance, velocity, response latency) at free cell locomotion and/or during induced photophobic responses. To illustrate the photomotility of cell samples in different tested experimental solutions, a long-exposure and dark-field photographic method, described first by Ferguson  and modified subsequently by Dryl , was applied. appropriate intensity, they display a defined step-up photophobic response (Fig. 1). In the population method, the dark-adapted cell samples, each containing 8-12 cells, were excited with white or monochromatic light applied from above. The source was continuous or pulsed actinic light from a stabilized 150 W light generator (MLW, Germany) in conjunction with an electromagnetic programmable shutter (22-841, Ealing Electro-Optics, England). The light was delivered close to cell with a fiber optic guide. The intensity of light in both methods was measured with a calibrated photodiode (VTA 9313, EG @ Vactec, U.S.A.) linked to a digital voltmeter. The ciliary reversals induced in cells by an external application of solution of mastoparan or potassium ions were performed by pressure injection of these substances with an automatic microinjector (IM-1, Narishige, Japan) from a micropipette positioned very close the cell surface. In such conditions, solutions used to excite the cell have direct and rapid access to the cell surface. To assess the locomotor responses of Blepharisma to light stimulation two specific motile parameters were measured: the photophobic response latency (Tl) of individual cells and photoresponsiveness (Rl) in cell populations. The Tl, defined as the time elapsed between the cell's entry into the light spot and the moment of initial ciliary (stop) response, was computed with the software. Rl values, expressed as the reciprocal of an effective stimulus dose (ED50), derived from fluence rate-photoresponse relationships indicate the light stimulus intensity eliciting photophobic responses in 50% of the cell population . Both the Tl and ED50 values thus obtained were normalized with respect to photoresponse values of control cells (taken arbitrarily as one). The data from the measurements are shown as average values obtained from five to nine cell samples for ED50 and at least 20 cells for Tl. The cortex fraction from Blepharisma cells and bovine rod outer segments (ROS) were prepared in accordance with methods described elsewhere [32, 33]. Partially purified transducin from bovine retina was used as a reference protein. The solubilized cell samples were analyzed by 10% SDS-PAGE electrophoresis with Mini-PROTEAN II System (Bio-Rad). The proteins thus obtained were transferred from the gels to nitrocellulose membranes (Bio-Rad) by electroblotting using Trans-Blot System (Bio-Rad) for 1 h at 100 V in a transfer buffer consisting of 192 mM glycine, 20% methanol and 25 mM Tris at pH 8.3. Subsequently, the resultant blots were blocked with a solution containing 3% bovine serum albumin (BSA) in TBS (150 mM NaCl, 10 mM Tris, pH 8.0) and 0.05% Tween (BSA/TBS/Tween) for 1h at room temperature. After blocking, the blots were incubated with polyclonal antibodies raised against µ -subunits of transducin (Tµ ) and G-protein (Gµ ) (NEN) overnight at a dilution of 1:1000 in 0.3% BSA/TBS/Tween at 4oC. A similar incubation procedure with BSA only (control) was applied to another blot. The membranes were finally washed several times in TBS with 0.05% Tween (TBS/Tween). 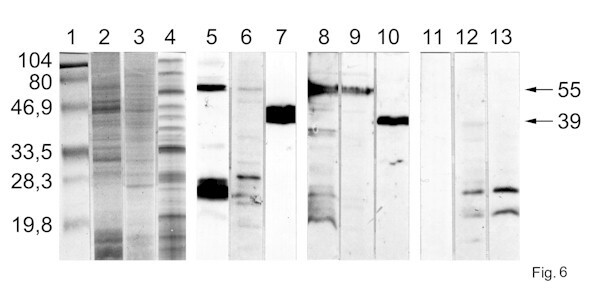 For protein detection, these membranes were incubated with a secondary goat anti-rabbit antibody conjugated with peroxidase (Calbiochem) at a dilution of 1:10000 in 0.3% BSA/TBS/Tween for 1 h, at room temperature and then they were washed in TBS/Tween solution and followed by a chemiluminescence detection process. and Rl parameters (Figs. 4 A, B, and 5D) were somewhat higher in comparison with that of Li+ at the concentrations and incubation times used. The cells treated with Li+ or heparin usually recovered shortly after the cells were transferred to solutions lacking these substances. mastoparan effect is also noticeable during long-term cell incubations (Fig. 5H). A prolonged incubation of cells adapted to darkness with mastoparan markedly decreased their light sensitivity, i.e. fewer photoresponding cells occurred in samples treated with mastoparan for longer times (Fig. 5F,H). The specific observed influence of mastoparan seems to be similar to the effect of light adaptation of these ciliates during sustained cell illumination. The mastoparan-induced changes in cell motility can be partially prevented by pretreatment of the cells with micromolar neomycin concentrations (data not shown). level of protein used in the sample tested. The 55 kDa protein is specifically recognized by the anti-rabbit Gµ -antibody in the cortex fraction (Fig. 6, lane 8) and cell lysate of Blepharisma (Fig. 6, lane 9). Two other weak protein bands in the Blepharisma samples were labelled in the low molecular weight range as well. No significant immunolabeling was observed in control blots with the ROS preparation when the primary antibodies were replaced by BSA only, confirming a specificity of labeling (Fig. 6, lanes 11-13). Gels stained with Coomassie blue indicate a rather low density of proteins in the area labelled by anti-transducin or anti-G-protein, excluding the possibility of non-specific label (Fig. 6, lanes 11-13). The most interesting feature in Blepharisma photomotile behavior is the latency time (Tl) of photophobic response. Under standard conditions, the measured Tl values are in the range of 0.8-1.5 s, depending on the intensity, spectral quality of stimulus used or temperature [2, 4, 15, 34]. This is quite a long the delay when compared to the 25-50 ms delay of motile response of Blepharisma elicited by the stimuli of different modality - mechanical stimulation [Fabczak, unpublished data]. A similar peculiar distinction in motile responses to photic and mechanical stimulation has been shown in the related ciliate, Stentor [35-37]. The mechanoreceptor potentials eliciting the ciliary reversals appear within milliseconds in most protozoan ciliates [35, 38, 39]. In both Blepharisma and Stentor, the delayed Tl of photoinduced ciliary reversals, correlating well with action potentials , seems to result from different biochemical events preceding membrane potential and ciliary locomotor events. Superficially at least, these biochemical processes in ciliate cells appear analogous to the signal transduction systems in a variety of metazoan receptor cells that involve specified time-limiting biochemical reactions [40,41]. The delayed ciliary responses to light stimuli in Blepharisma may reflect a rather slow intracellular signal processing that finally culminates in membrane depolarization (receptor potential) and triggers an action potential coupled to the ciliary reversal. The photoresponse delay in Blepharisma, together with an analysis of cell photoresponsiveness, therefore, are useful tests to quantify the actual efficiency of light signal transduction to study the mechanism of the cellular sensory transducing system. There is compelling evidence that inositol trisphosphate, one of the products of phosphatidylinositol 4,5-bisphosphate hydrolysis by specific phospholipase C (PLC), plays the crucial role as a second messenger in the transduction systems of a variety receptor cells in higher organisms [42-46]. In lower eukaryotes, a phosphoinositide metabolism has also been reported to exist [47-49]. The function of the phosphoinosotide-based system has been shown in the protozoan amoebae Dictyostelium , parasitic Entamoeba  and in yeast cells , and suggested to exist in the protist Euglena , Paramecium  and Tetrahymena . Such drugs like neomycin, heparin and lithium ions, are widely known modulators that severely impede the phosphoinositide signaling pathway at various stages. An evident decrease of light sensitivity caused by neomycin and Li+ in photoreceptor cells of Hermissenda and Limulus it has been reported [24,42,44,53]. The inhibitory effect of heparin on the responses induced by light stimuli was clearly showed in Limulus photoreceptor cells [42,53,54] and in a variety of other cell receptor systems identified in the brain, smooth muscle, and liver [55-57]. The behavioral investigations reported here provide convincing evidence that each of the three compounds tested, neomycin, heparin and Li+, are also capable of decreasing or even blocking the light-induced ciliary responses in protozoan ciliate Blepharisma. These results clearly indicate that the presence of phosphoinositide pathway modulators makes light signal processing less effective and, as expected, the cell photomotile behavior is markedly disturbed (increased Tl and lowered Rl values). An introduction of mastoparan, a tetradecapeptide from wasp venom, into medium containing dark-adapted ciliates elicited a delayed ciliary response that is a distinctive feature of ciliary reversal during the cell photophobic response. Sustained adaptation of cell samples to mastoparan also mimics an effect of light adaptation - it markedly lowers the sensitivity of the ciliate to light stimulation. Mastoparan is known to effectively activate heterotrimeric and small G proteins and it increases the cytoplasmic inositol trisphosphate level in a variety of animal and plant cells [58-61]. However, it may directly activate PLC resulting in cell membrane disruption at higher concentrations, as shown for rabbit brain cells . It is supposed that in Blepharisma cells, mastoparan used at micromolar concentrations acts via a G-protein rather than triggers cellular PLC. In point of fact, an immunoblot analysis of Blepharisma preparation indicated an existence of a heterotrimeric G-protein µ -subunit, or at least a protein homologous to it. Among protozoan ciliates, the participation of a 57 kDa GTP-binding protein and 39 kDa G-protein µ -subunit in the phototransduction has already been reported for Paramecium  and Stentor , respectively. An identification of several lower molecular weight bands in the blot from ciliate cells is consistent with earlier reports on the presence of monomeric G-proteins in another ciliate, Paramecium , which shows no sensitivity to light. The molecular masses of most G-protein µ -subunits are in the range between 39 and 52 kDa , although other G-proteins with larger molecular masses have been shown for different cell preparations [66-68]. The findings obtained in this study may indicate that Blepharisma possesses, besides monomeric G-proteins as in Paramecium and cells of other organisms, an heterotrimeric G-protein that can be exactly involved in the photo-signal transduction process. This work was supported by grant from the State Committee for Scientific Research KBN-6 P203 046 04 to Hanna Fabczak and statutory funding for the Nencki Institute of Experimental Biology. A. C. Giese, The photobiology of Blepharisma, in: K. C. Smith (Ed. ), Photochem. Photobiol. Rev., Plenum Press, New York, 1981, pp. 139-180. Blepharisma japonicum, Photochem. Photobiol. 37 (1983) 313-319. T. Matsuoka, Negative phototaxis in Blepharisma japonicum, J. Protozool. 30 (1983) 409-414. Blepharisma japonicum, Photochem. Photobiol. 57 (1993) 872-876. Zool. Sci. 9 (1992) 529-532.
responses of Blepharisma japonicum. I. Action spectra determination and time-resolved fluorescence of photoreceptor pigments, J. Photochem. Photobiol. B: Biol. 1 (1987) 75-84. T. Matsuoka, S. Matsuoka, Y. Mamaoka, T. Kuriu, Y. Watanabe, M. Takayanagi, Y. Kato, K. Taneda, Action spectra for step-up photophobic response in Blepharisma, J. Protozool. 39 (1992) 498-503.
response of the blue and red forms of Blepharisma japonicum, Photochem. Photobiol. Photochem. Photobiol. 58 (1993) 275-279.
response of unicellular organism, Blepharisma, Photochem. Photobiol. 62 (1995) 190-193. Photochem. Photobiol. 65 (1997) 915-921. F. Inaba, R. Nakamura, S. Yamaguchi, An electron-microscopic study on the pigment granules of Blepharisma, Cytologia (Tokyo) 23 (1958) 72-79. P. Koprowski, M. Walerczyk, B. Groszyñska, H. Fabczak, A. Kubalski, Modified patch-clamp method for studying ion channels in Stentor coeruleus, Acta Protozool. (1997) 121-124.
ciliates. II. Possible role of G-protein and cGMP in Stentor coeruleus, Photochem. Photobiol. 57 (1993) 702-706. H. Fabczak, N. Tao, S. Fabczak, P.-S. Song, Photosensory transduction in ciliates. Photochem. Photobiol. 57 (1993) 889-892.
phosphatidylinositol 4,5-bisphosphate (PIP2), Biochim. Biophys. Acta 979 (1989) 105-112.
modulated by multivalent cations La3+, Al3+, neomycin, polyamines, and mellitin, J. Lipid Mediators Cell Signaling 11 (1995) 81-91.
cellular signal transduction, Nature (Lond.) 312 (1984) 315-321. S. Supattapone, P. F. Worley, J. M. Baraban, S. H. Snyder, Solubilization, purification and characterization of an inositol trisphosphate receptor, J. Biol. Chem. 263 (1988) 1530-1534. P. M. O'Day, C. L. Phillips, Effect of external lithium on the physiology of Limulus ventral photoreceptors, Visual Neurosci. 7 (1991) 251-258.
cycle: an example of uncompetitive inhibition and its pharmacological consequences, TIPS 12 (1991) 297-303.
inositol trisphosphate receptor in ciliate Blepharisma, Acta Protozool. 37 (1998) 209-213. Blepharisma, Abstr. 7th Congr. Eur. Soc. Photobiol., Stresa, Italy (1997) p. 135.
responses in Blepharisma (short communication), Acta Protozool. 35 (1996) 251-256. Paramecium and other motile cells, Physiol. Zool. 30 (1957) 208-215.
problems, Post. Biochem. 6 (1960) 83-113.
submembranous calcium storage component, J. Biol. Chem. 113 (1991) 103-112. Plenum Press, New York, 1991, pp. 257-265. D. C. Wood, Action spectrum and electrophysiological responses correlated with the photophobic response of Stentor coeruleus, Photochem. Photobiol. 24 (1976) 261-266.
coeruleus depends upon the ratio of extracellular Ca2+ to K+ ions, Comp. Biochem. Physiol. 100 (1991) 711-714. Photochem. Photobiol. 57 (1993) 696-701. Paramecium, J. Gen. Physiol. 61 (1973) 572-587. R. Eckert, Bioelectric control of ciliary activity, Science 176 (1972) 473-481. Sensory Transduction, D. P. Corey, S. D. Roper (Ed. ), The Rockefeller Univ. Press, New York, 1991, pp. 62-71.
photoresponse, J. Gen. Physiol. 54 (1969) 310-330. T. M. Frank, A. Fein, The role of the inositol phosphate cascade in visual excitation of invertebrate microvillar photoreceptor, J. Gen. Physiol. 97 (1991) 697-723. Rockefeller Univ. Press, New York (1992) 201-217. M. Sakakibara, D. A. Alkon, T. Kouchi, H. Inoue, T. Yoshioka, Induction of photoresponse by the hydrolysis of polyphosphoinositides in the Hermissenda type B photoreceptor, Biochem. Biophys. Res. Commun. 202 (1994) 299-306.
vertebrates and invertebrates, J. Photochem. Photobiol. B. 7 (1990) 107-148.
receptor cells, Physiol. Rev. 78 (1998) 429-466.
release from a non-mitochondrial pool in amoebae of Dictyostelium, Biochim. Biophys. Acta 887 (1986) 335-340.
calcium release from internal stores of Entomoeba histolytica, Mol. Biochem. Saccharomyces cerevisiae, FEBS Lett. 323 (1993) 113-118. W. Masuda, S. Takenaka, S. Tsuyama, M. Tokunaga, R. Yamaji, H. Inui, K. Miyatake, Y. Nakano, Inositol 1,4,5-trisphosphate and cyclic ADP-ribose mobilize Ca2+ in protist, Euglena gracilis, Comp. Biochem. Physiol. 118C (1997) 279-283. J. Beisson, F. Riuz, Lithium-induced respecification of pattern in Paramecium, Dev. Genet. 13 (1992) 194-202.
pathway blocks one light-activated current component in Limulus photoreceptor, J.
Comp. Physiol. A 177 (1995) 601-610. M. N. Faddis, J. E. Brown, Intracellular injection of heparin and polyamines. Effect on phototransduction in Limulus ventral photoreceptor, J. Gen. Physiol. 101 (1993) 909-931. C. C. Chadwick, A. Saito, S. Fleischer, Isolation and characterization of the inositol trisphosphate receptor from smooth muscle, Proc. Natl. Acad. Sci. USA 87 (1990) 2132-2136. S. K. Joseph, S. Samanta, Detergent solubility of the inositol trisphosphate receptor in rat brain membranes, J. Biol. Chem. 268 (1993) 6477-6486.
membrane is an (1,4,5)IP3 activated and (1,3,4,5)IP4 inhibited calcium permeable ion channel, Cell Calcium 17 (1995) 141-153. B. K. Drobak, P. A. C. Watkins, Inositol(1,4,5) trisphosphate production in plant cells; stimulation by the venom peptides, mellitin and mastoparan, Biochem. Biophys. Res. Commun. 205 (1994) 739-745.
determinats of activity, J. Biol. Chem. 265 (1990) 14176-14186. G. Koch, Habermann, C. Mohr, I. Just, K. Aktories, Interaction of mastoparan with the low molecular mass GTP-binding proteins rho/rac, FEBS Lett. 291 (1991) 336-340. Biochim. Biophys. Acta 1006 (1989) 311-316. Paramecium, J. Protozool. 38 (1991) 495-501. L. Birnbaumer, G proteins in signal transduction, Annu. Rev. Pharmacol. Toxicol. 30 (990) 675-715. M.-J. Imm, R. M. Graham, A novel guanine nucleotide-binding protein coupled to the a1-adrenergic receptor. I. Identification by photolabeling membrane and ternary complex preparations, J. Biol. Chem. 265 (1990) 18944-18949. Biochim. Biophys. Acta 1095 (1991) 140-148. J. Zhu, M. L. Toews, R. G. MacDonald, T. D. Hexum, Neuropeptide Y promotes GTP photo-incorporation into a 55 kDa protein, Eur. J. Pharmacol. 268 (1994) 279-291. Fig. 1. Photophobic response of Blepharisma - cell enters a light spot (marked with x) with its anterior part. The positions of the slow forward and accelerated backward swimming, followed by renewed forward movement, were traced with a computer from a stored videorecording. Fig. 2. Influence of externally applied neomycin on (A) photophobic response latency and (B) cell photoresponsiveness of Blepharisma. Dark-adapted ciliates were incubated with neomycin for (¯) 5 and (o) 15 min, (C) changes in photoresponsiveness on time incubation with different concentrations of neomycin. Fig. 3. Effect of treatment of Blepharisma cells for (¯) 10 and (o) 30 min by external Li+ on the (A) photophobic response latency and (B) cell photoresponsiveness. Fig. 4. Dependence of the cell response latency (A) and cell photoresponsiveness (B) on cell incubation for (¯) 10 and (o) 30 min with heparin at different concentrations. Fig. 5. Low-magnification light micrographs illustrating Blepharisma motility (dark-field, 12 s exposure). (A) control cells adapted to low light intensity and (B) after subsequent increase of light intensity; (C), (D) and (E) cell responses to light stimulation following 10 min treatment with 5 µM neomycin, 20 µg/ml heparin and 2.5 mM Li+, respectively; (G) cell responses to the addition of 0.5 µM mastoparan to control solution; (F) and (H) illustration of cell photoresponses after adaptation to 0.5 µM mastoparan for (F) 3 min and (H) 10 min. Fig. 6. Immunoblotting of Blepharisma pellicle fraction and whole cell homogenate with anti-transducin and anti-G-protein µ -subunits. 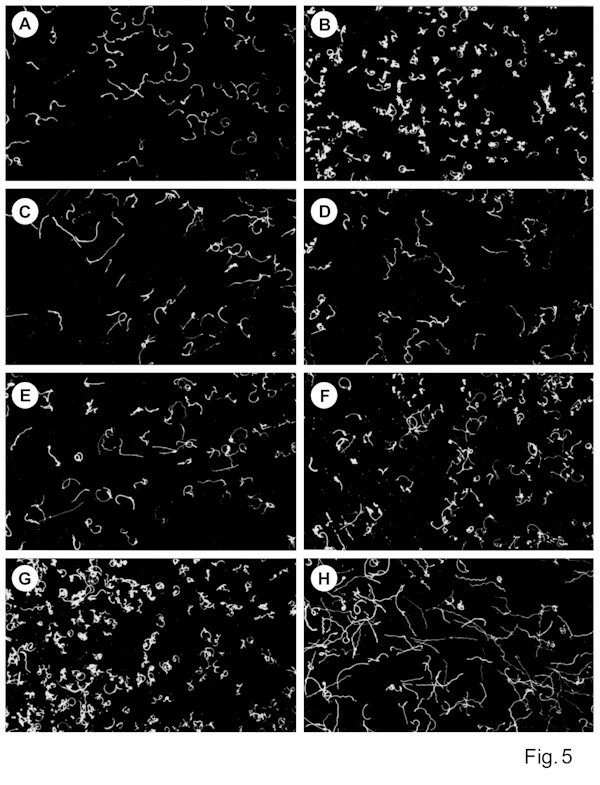 Blepharisma cortex fraction (40 µg of protein/lane), Blepharisma lysate (30 µg of protein/lane) and rod outer segments (ROS) (60 µg of protein/lane) were separated on 10% SDS-polyacrylamide gels. One gel was stained with Coomassie Brilliant Blue R-250 (lanes: 2-4). The other gels were blotted on to nitrocellulose and µ -transducin antiserum (lanes: 5-7) or µ -G-protein antiserum (lanes: 8-10) binding was detected. Blepharisma cortex fraction (lanes: 2,5,8); lysate (lanes: 3,6,9); ROS (lanes: 4,7,10). Control immunolabelling was carried out with secondary antibody only: Blepharisma cortex fraction (lane: 12), lysate (lane: 13) and ROS (lane: 11). Molecular weight standards of the indicated mass (lane: 1).